PSYCHOPHANTS for sycophants. Rocked me back in my seat. Happy Halloween to you all, and I hope you're ready for the approaching deluge of postiness from me. Tomorrow NaBloPoMo begins...a post a day for the whole month. I found myself, just now, emptying the dishwasher and lifting a glass to the light to look for streaks. Helloooooo, Stepford. 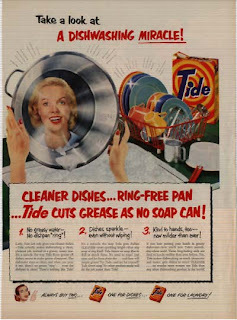 In my defense, I'd used a sample of a new detergent, and wanted to see what the fuss was about. So it's OK. Really. Right? Still here - sick kid who was AWFULLY miserable and is now much better, and other bad news stuff that I can't do anything about and makes me wish I were in the States...no knitting this week so far. Instead, let's distract ourselves (look, a puppy!!) with a quick meme, lifted from Robyn at www.bitchypoo.com. Mmmkay? Favorite Fall Indulgence: coffee (wait, that's all-season. Pumpkin pie). Out Your Window: gardener truck. On Your Desk: no desk. On Your Feet: clogs (and hand knit socks). Something You Want to Make Sure You Do this Fall: pumpkins. You Last Took a Fall: ??. Your Take On Seasonal Novelty Flags (i.e. turkeys, pumpkins, scarecrows): Ehh. A New Fall Show You Like: nothing new here. Your Plans for the Evening: none. Your Relationship With Pumpkins: friendship :). Go see this - I promise it's interesting. I also bought some mohair almost that shade at a charity shop today. But I digress. More content soon! Is there such a thing as too many knitting needles? I am in the midst of cataloguing mine for my Ravelry notebook and it's enlightening. Who knew I had at least a dozen crochet hooks, when I very seldom crochet? Who knew I had 29 pairs of needles without getting even halfway through the pile? Let alone sock needles and circulars. Hmmm. This does not include the several pairs of needles living out in the knitting house, and the needles that are living in various WIPs. Hmmmm again. I have used the opportunity to get rid of almost a dozen pairs of soft plastic needles that were well warped. I have several orphan needles so far, and I think I'll be ditching those too, rather than banding them together hopefully. In my defense, the vast majority of my needle stash comes from thrift stores and yard sales. It will be good to have it all organized. I still need to figure out a better storage system then up-ended into containers. Perhaps a long scarf as needle roll for the meantime. Anyone out there type "doe snot" for "does not" a lot? Anyone out there snort whenever they do this? I do, I do! How cute is THIS? 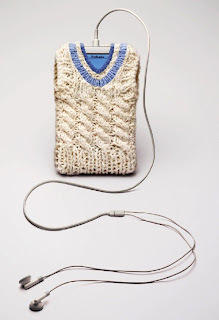 The UK Handknitters website has the pattern available here (scroll down for iPod cosy). Absolutely cracked me up - this is a sweater I believe I could finish.